This gemstone is found in a mountain range in Chihuahua, Mexico. Laguna lace agate is in the quartz family and banded with chalcedony. Metaphysically, laguna lace agate is used for stabilizing and strengthening. Laguna Lace Agate 10mm round swirly browns, greys and reds New! Laguna Lace Agate 12mm coin swirly browns, greys and reds New! Laguna Lace Agate 12mm square swirly browns, greys and reds New! Laguna Lace Agate 30 x 40mm oval swirly browns, greys and reds New! 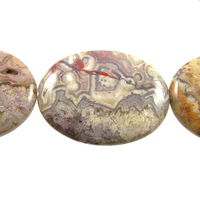 Laguna Lace Agate 4mm round swirly browns, greys and reds New! 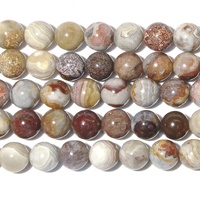 Laguna Lace Agate 6mm round swirly browns, greys and reds New! Laguna Lace Agate 8mm round swirly browns, greys and reds New! Laguna Lace Agate 8 x 10mm nugget swirly browns, greys and reds New!